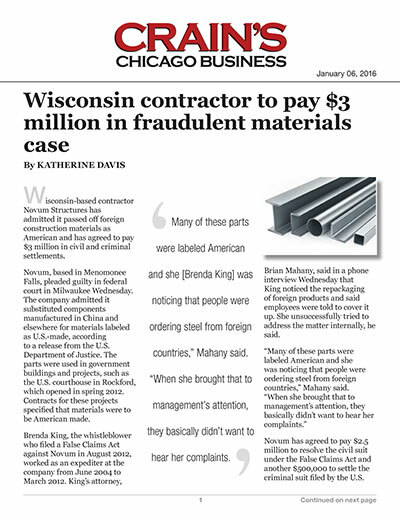 Wisconsin-based contractor Novum Structures has admitted it passed off foreign construction materials as American and has agreed to pay $3 million in civil and criminal settlements. Novum, based in Menomonee Falls, pleaded guilty in federal court in Milwaukee Wednesday. The company admitted it substituted components manufactured in China and elsewhere for materials labeled as U.S.-made, according to a release from the U.S. Department of Justice. The parts were used in government buildings and projects, such as the U.S. courthouse in Rockford, which opened in spring 2012. Contracts for these projects specified that materials were to be American made. Brenda King, the whistleblower who filed a False Claims Act against Novum in August 2012, worked as an expediter at the company from June 2004 to March 2012. King's attorney, Brian Mahany, said in a phone interview Wednesday that King noticed the repackaging of foreign products and said employees were told to cover it up. She unsuccessfully tried to address the matter internally, he said. Novum has agreed to pay $2.5 million to resolve the civil suit under the False Claims Act and another $500,000 to settle the criminal suit filed by the U.S. government, according to the Justice Department statement. King will receive some $400,000, as False Claims Acts allow the whistleblower to earn 15 percent to 30 percent of the amount recovered. Loften said there were no issues with the quality of the foreign materials and that they represented just 3 percent of Novum's total business. In the past several years, False Claims Act lawsuits have returned approximately $20 billion in taxpayer dollars lost to fraud back to the U.S. government.